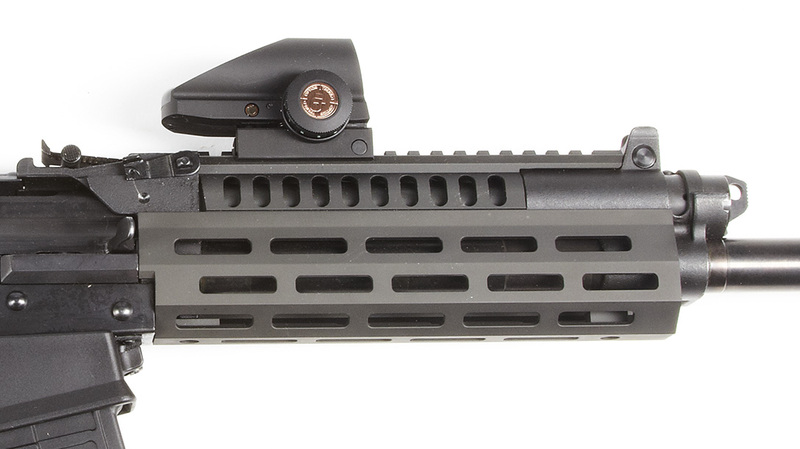 The handguard has a Picatinny top rail for optics. 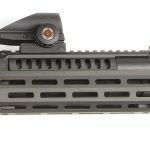 The handguard also has M-LOK slots on the sides and bottom for additional accessories. 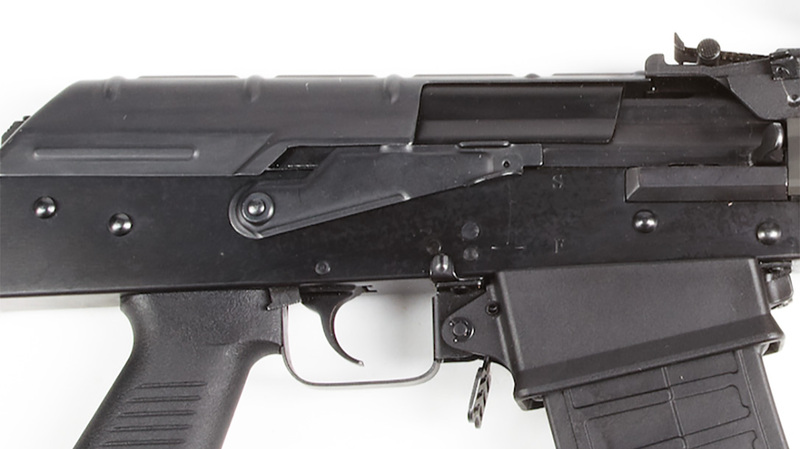 The EM-12B comes with two polymer, five-round magazines that load into the gun with less of an angle than required with a typical AK rifle. 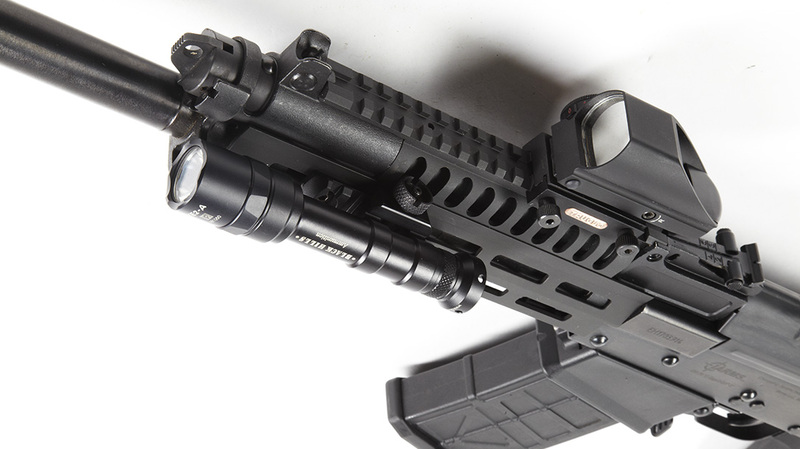 The forend’s M-LOK slots help reduce weight. 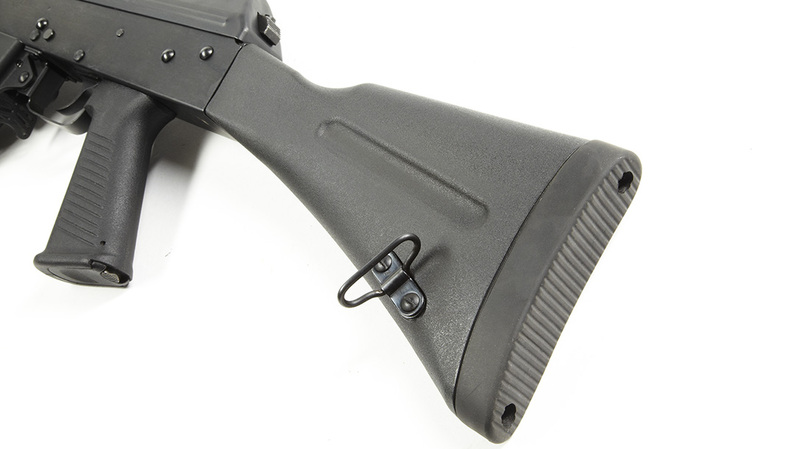 The synthetic stock features a sling loop on the left side as well as a thick rubber buttpad. Also note the large magazine release. Note the adjustable gas block. 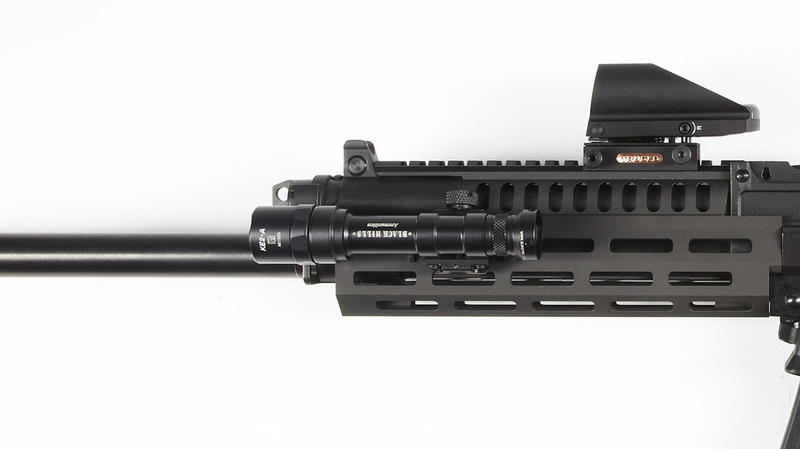 The large TruGlo Tru-Brite sight, with its 5-MOA dot reticle and wide viewing window, helped the author get accurate hits during range drills. 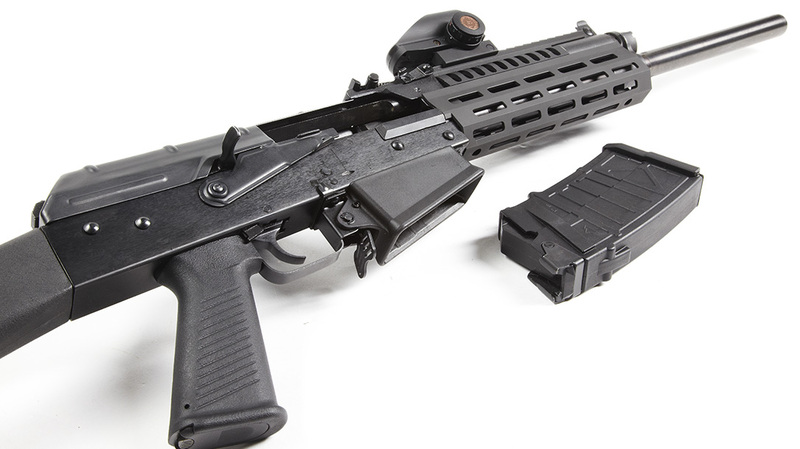 There’s a new tactical shotgun on the market, and it’s good news for fans of the AK platform. It’s called the EM-12B, and Inter Ordnance (IO) imports it from China through its companion company Royal Tiger Imports. 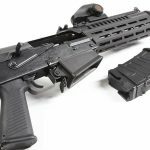 This new gun, made by the Chongqing Jianshe Industry Group, is an updated version of the classic Russian AK-pattern shotguns that have been held in high esteem due to their reputation for reliability and rugged construction. 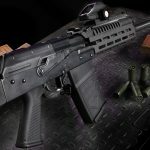 However, the popular Russian guns have not been legal to import into the U.S. since President Obama issued Executive Order 13662 after Russian forces invaded portions of the Ukraine. I had a chance to travel down to Palm Bay, Florida, and saw a prototype of the EM-12B when I visited the IO factory. 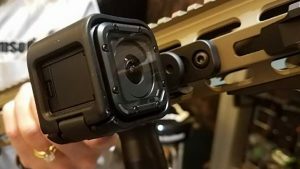 Handling it convinced me that this is a gun with real potential for competition shooting and hunting, as well as for law enforcement and personal defense. 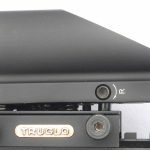 As soon as the production models came into the country, I contacted IO and arranged to get a sample. Whenever I receive a new gun for testing, I examine it for fit and function right away. That way, if the gun doesn’t meet my standards, I can return it to the factory without going through a lot of paperwork. The EM-12B looked good and functioned well right out of the box; I couldn’t wait to get it home and field-strip it on my workbench to see if it looked as good on the inside as it did on the outside. Usually a firearm’s interior surfaces are not as highly finished in their non-critical areas as their exterior surfaces. So, I was pleasantly surprised at how good the gun looked internally. The quality of the interior’s finish was just as good as the outside. The only mold or tool marks anywhere on the gun were a few lines on the bolt-hold-open button. The evenness of the matte surface finish was exactly the same inside and out. All parts were well conformed, angled surfaces were precisely made, lines were even, and the fit of the gun’s components was very good. The end result is a gun that operates smoothly. The bolt glides back and forth on the rails, locking and unlocking without hesitation. The two-stage trigger breaks at 4 pounds. The first stage is 2.5 pounds, and after the trigger travels about 0.375 inches, it takes another l.5 pounds of pressure to drop the sear. The travel is smooth, but there is a bit of overtravel. 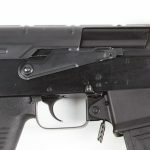 The large safety lever operates like other AKs, staying solidly in the “safe” position, requiring intentional pressure to disengage it. The magazine well is a bit tight with the supplied five-round magazines. It takes a bit of time to learn to change magazines because they don’t “rock and lock” as much as typical AK magazines. Instead they insert at a shallow angle, rock slightly back and then firmly lock up with a tap from the weak hand. With these magazines, the gun fed, extracted and ejected flawlessly. 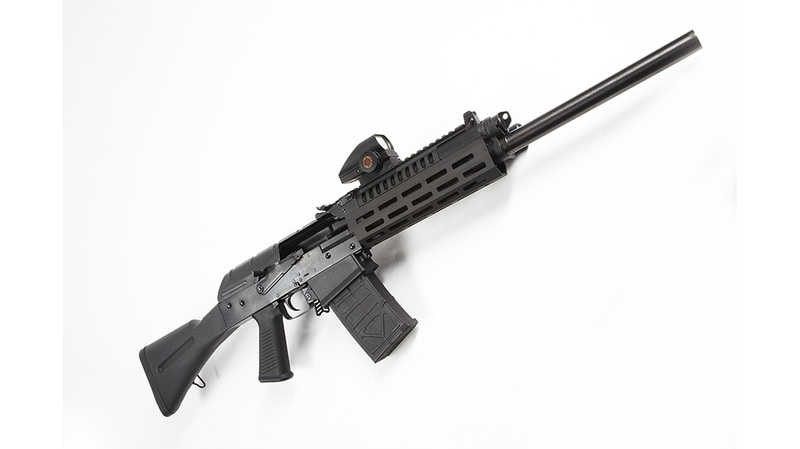 The EM-12B is a classic AK-pattern gun with the addition of several highly desirable features. 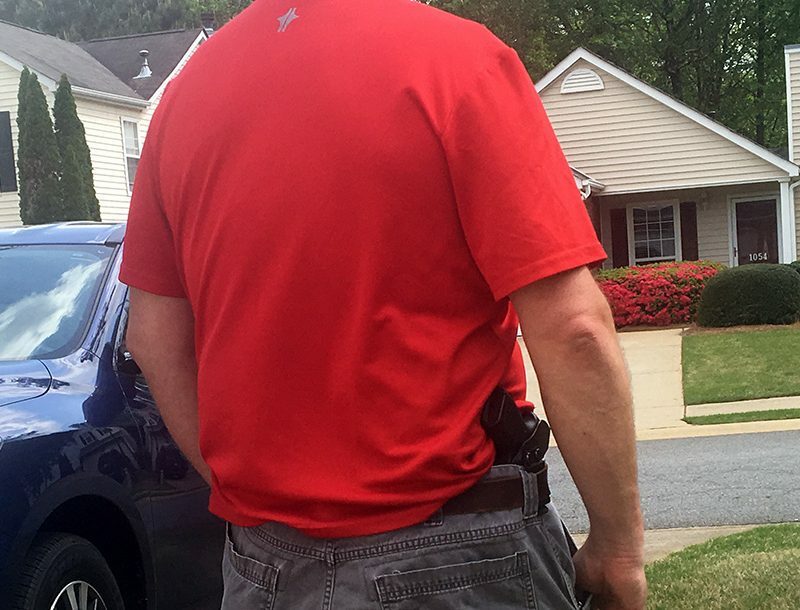 For example, it has a bolt-hold-open button located behind the trigger. 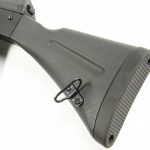 This is a very useful safety feature because the gun’s user can lock the action open to “show clear” when transporting the gun or laying it on a shooting bench with a chamber flag in the barrel. The hold-open button does not activate automatically after the last shot like most other semi-autos, but at least it gives the operator a choice to manually lock the gun in the open position. Like other high-tech semi-auto shotguns, the EM-12B is chambered for both 2¾- and 3-inch shells. I personally find the 2¾-inch shells adequate, but someone wanting to carry magnum slugs for defense against bears may want the extra power of the longer shells. Speaking of ammunition, the gun has a four-position-adjustable gas system so the user can tune it for any shell. The manual advises using the least amount of gas needed to operate this shotgun in order to save wear and tear on the action. In addition, the EM-12B also comes with three choke tubes that make it useful for just about any type of hunting you may want to do with it. For hunting some species of game, a three-shot magazine would be required, however, and I could not find any available on the web. 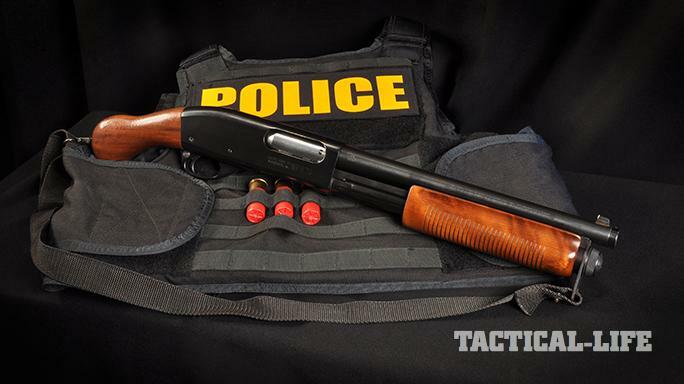 Finally, the new shotgun has a couple of features that enhance its utility for competition and tactical applications. The first is its 18.5-inch barrel. This barrel swings very quickly and points instinctively. Overall, the EM-12B is 39.5 inches long. For comparison, my Remington 1100 is 44 inches long with its 22-inch deer barrel installed. 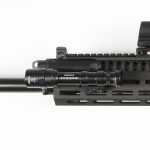 In addition, the shotgun has an M-LOK forend with a Picatinny top rail, which allows for the mounting of a variety of accessories. 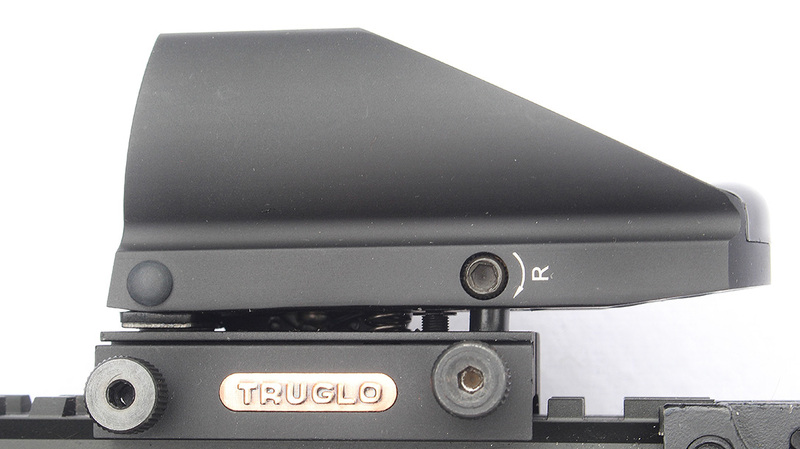 For this test, I mounted a TruGlo Tru-Brite sight with a wide 34x24mm window and a 5-MOA dot reticle in red or green. I chose the 5-MOA dot size because this is primarily a close-range gun, especially when using buckshot. The second accessory that I mounted is a 600-lumen SureFire M600 Ultra Scout light that was given to me some time ago by my friends from Black Hills Ammunition. It works very well with the Tru-Brite sight. 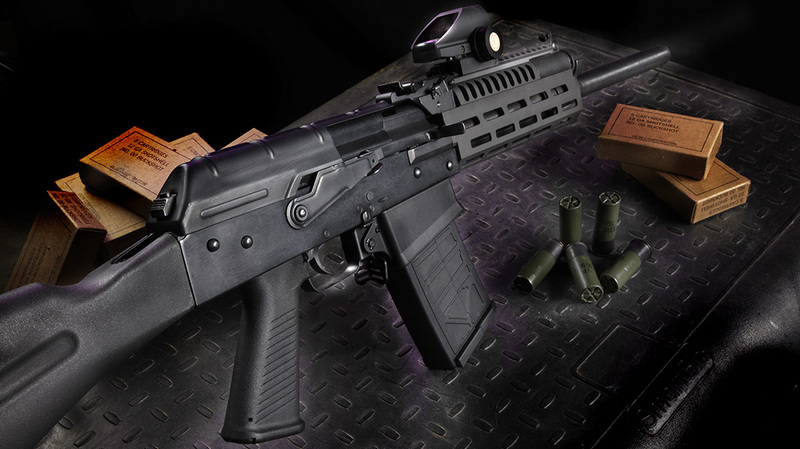 With a fully loaded magazine in place, this complete tactical package weighs 10.5 pounds, which, combined with the gas piston operating system, helps reduce—but does not entirely eliminate—the recoil of heavier 12-gauge loads. 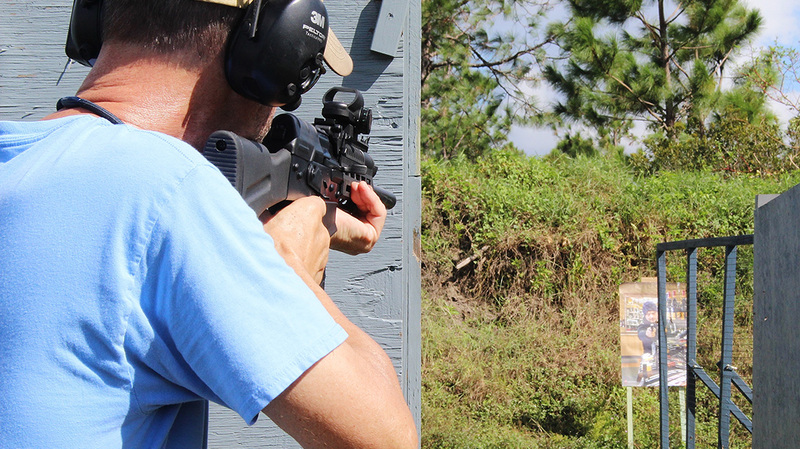 I tested the EM-12B at the Volusia County Gun & Hunt Club and the Flagler Gun & Archery Club. Since the gun was set up for tactical applications, I didn’t do any bench testing when I sighted it in. 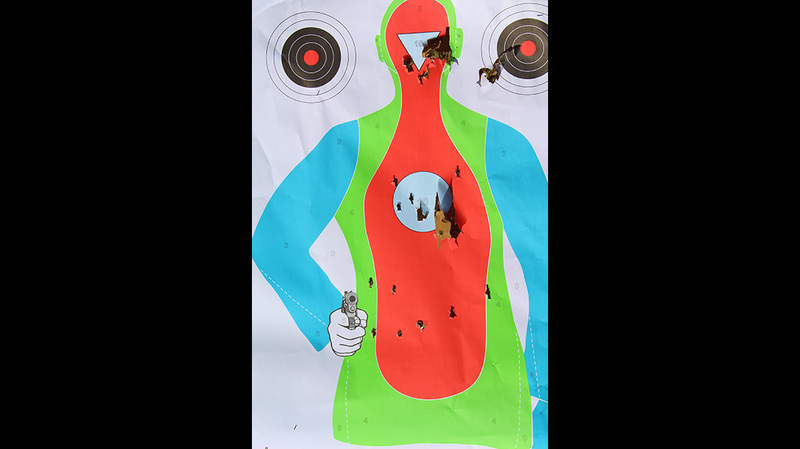 Instead, I used the tried-and-true system of using a silhouette target and moving progressively back from the target to sight in the optic and pattern the gun with buckshot. Starting with slugs at a distance of 5 yards, I fired, adjusted the dot and fired again until the shot hit where the dot indicated. Once on target, I moved back another 5 yards and began all over. I repeated this process until the sight was aligned with the point of impact at 25 yards. I used Federal Premium 1-ounce, 2¾-inch Hydra-Shok slugs with an improved cylinder choke tube selected for testing both slugs and buckshot. 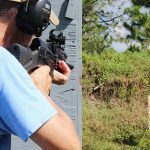 To check for tactical accuracy, I used the Volusia County club’s house-front simulator. 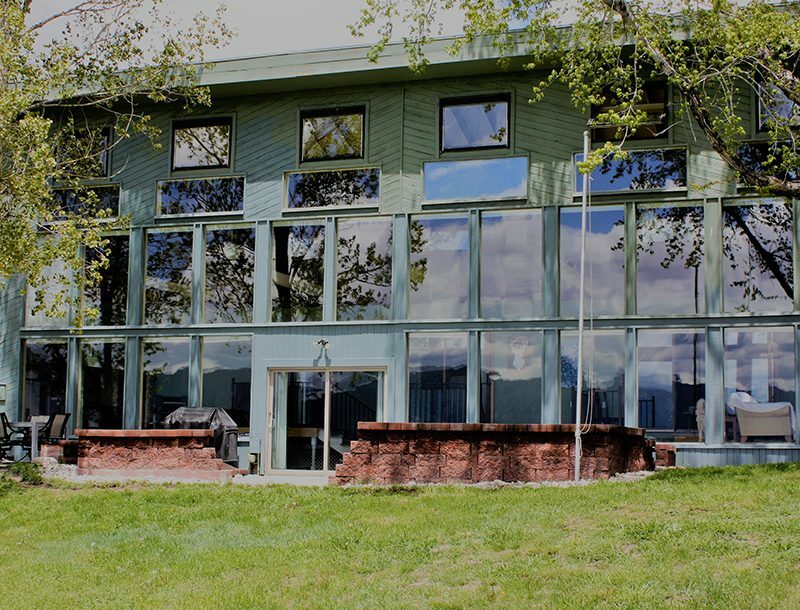 It looks like a house or storefront with two doors and a window. The drill I ran was quite simple: Just round the corner of a doorway and identify and neutralize a hostile target 20 yards down a hallway. Five repetitions of the drill put five slugs in a 3-inch group in the in the area of the heart and the base of the neck. The next test involved patterning buckshot. I selected Hornady’s eight-pellet Critical Defense 00 buckshot ammunition. 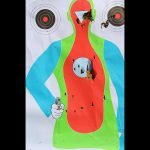 I placed three shots on the same silhouette target from three distances: 7, 10 and 25 yards. The 7-yard shot was a headshot. As best as I could tell, all pellets were in the head and grouped into less than 3 inches. With both the buckshot and slug tests, exact measurements were difficult because the gun tended to shoot the wads very close to the point of impact of the lead projectiles. The buckshot group at 15 yards in the center chest measured about 4.5 inches, and the 25-yard group was well centered in the lower abdomen and 7.5 inches across. All twenty-four 00 buckshot pellets were on the target. That’s truly excellent performance for both the gun and ammo. The final test was a rapid-fire function test using some old Federal 2¾-inch magnum shells with 1.5 ounces of #4 shot. 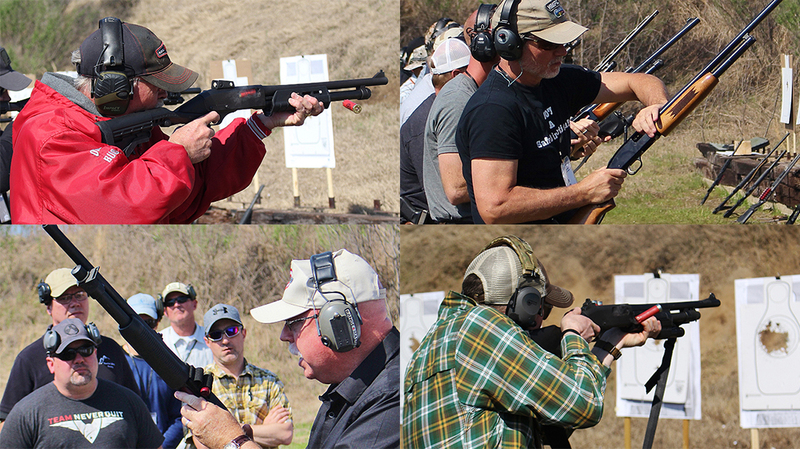 I loaded one shell in the chamber and five in the magazine and fired at a bare spot on the lower half of the berm. The gun ran flawlessly. I was very glad that the gun weighed a bit over 10 pounds because those old duck loads from the 1970s produced quite a bit more recoil than the slugs or buckshot. The EM-12B’s quality of manufacture and flawless performance right out of the box were impressive. Equally impressive is its $579 price tag. That’s only a bit more than the retail price of a high-quality tactical pump action gun and at least $150 less than the full retail price of most competitors’ tactical semi-autos. That’s a decent savings which can be spent on accessories. 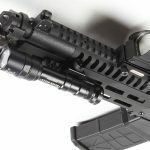 The TruGlo sight performed very well and is also affordable, and there are good quality tactical lights available for under $100. So even if you pay full retail price for everything, you can still get a quality fully equipped EM-12B with all the accessories for just under $900. 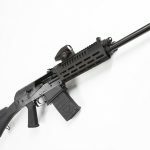 If you’re looking for a straight-shooting, rugged and reliable tactical 12 gauge, you might give this new gun from Inter Ordnance and Royal Tiger Imports serious consideration. For more information on Royal Tiger Imports, visit royaltigerimports.com. For more on I.O. Inc, visit ioinc.us. 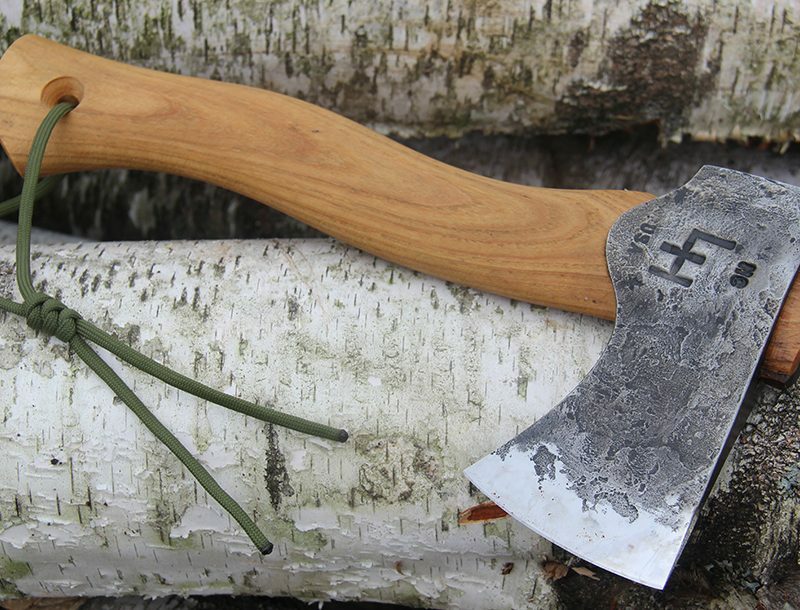 This article was originally published in the 2018 issue of “AK-47 & Soviet Weapons.” To order a copy, visit outdoorgroupstore.com.